TheraBite Pads - Available in standard, pediatric, and edentulous. 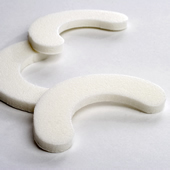 CranioRehab Pads - Available in standard and edentulous. Bitepads for the OraStretch press Press and TheraBite jaw motion rehab systems. We offer packs from ATOS (TheraBite) and CranioRehab brand packs with 4 pads. Edentulous extra-thick pads for patients with dentures or missing teeth on the standard adult device (AT1054, generic CR1054).